Click on “Buy Now” to order. Login into PayPal or pay with debit or credit card. Please note that there is a maximum quantity of 5 packets per order. If you need additional packets, please email livpro@mlfbiotech.com for a shipping quote. The shipping will jump to $999.99 to alert you for quantities above 5. All orders are shipped via USPS Priority Mail (2 – 3 day service) with both dry ice snow and an ice pack to keep the contents cool. All orders will be shipped with a temperature sensitive sticker applied to one of the Liv-Pro packets. These monitor the temperature of the product throughout shipment. Orders are packed and shipped to keep the Liv-Pro probiotic packets below 80 degrees F while in transit. Although the package may arrive with the dry ice dissipated, the sticker will confirm if the temperature has exceeded the point where product degradation can occur, and for how long that temperature has been exceeded. If you have questions regarding your order, please email livpro@mlfbiotech.com. We ship within the United States only. For Indiana residents, 7% sales tax will be added to product total. 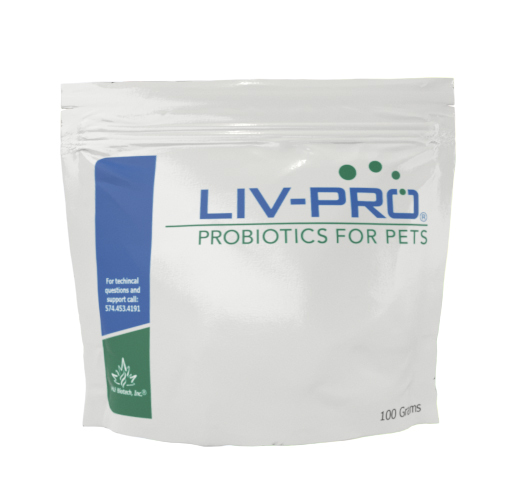 Liv-Pro Probiotics for Pets is made in the USA for dogs and cats by MLF Biotech, Inc. Its mission is to improve animal and human health by providing innovative natural products and services that have a positive impact on our environment. © 2019 MLF Biotech, Inc. Liv-Pro is a registered trademark under license to MLF Biotech, Inc.